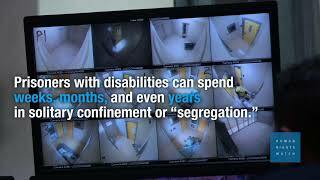 (Sydney, February 7, 2018) – People with disabilities in prisons across Australia are at serious risk of sexual and physical violence, and are disproportionately held in solitary confinement for 22 hours a day, Human Rights Watch said in a report released today. The 93-page report, "I Needed Help, Instead I Was Punished: Abuse and Neglect of Prisoners with Disabilities in Australia," examines how prisoners with disabilities, including Aboriginal and Torres Strait Islander prisoners, are at serious risk of bullying, harassment, violence, and abuse from fellow prisoners and staff. Prisoners with psychosocial disabilities – mental health conditions – or cognitive disabilities in particular can spend days, weeks, months, and sometimes even years locked up alone in detention or safety units. State and federal governments should end the use of solitary confinement for prisoners with disabilities, ensure that appropriate services are available to meet their needs, and more effectively screen prisoners for disabilities as they enter prison.